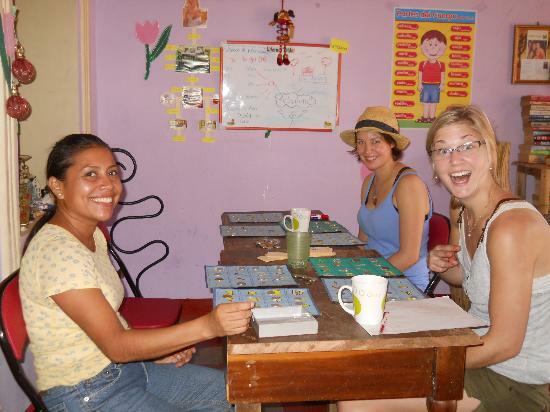 Welcome to Casa Nica Spanish, your Spanish language school in Granada, Nicaragua. We are a cooperative of women that has been teaching Spanish since 1998. We tailor Spanish classes according to your skill level and interests, and we make sure that you have a lot of fun while meeting people and getting to know our community through fabulous afternoon activities. We can also provide home-stay accomodations which will further enhance your learning experience while giving you the opportunity to make friends with a local family. And, if you are interested volunteering, we can connect you with our favorite local organizations that do amazing things to improve our community. Please let us know if we can help you while you are in Granada, and check out our Links page for helpful local information. We are confident that you will enjoy learning Spanish at Casa Nica Spanish School, and hopefully you’ll come back to see us again some day as many of our other students have done over the years. Beginner, Intermediate, or Advanced — we will improve your Spanish!